Despite the last one coming out four years ago and earning shrugs from critics and moviegoers alike (as well as being down a central star), Universal is banking on there still being a considerable audience for the Bourne franchise with this summer’s Jason Bourne. 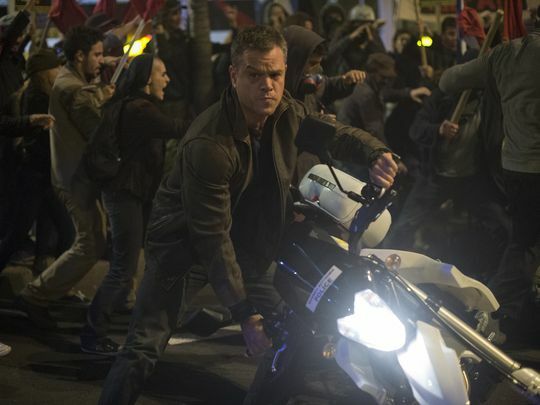 For the spy series’ fifth outing, the film finds Matt Damon back in the titular role with Paul Greengrass (The Bourne Supremacy, The Bourne Ultimatum) back behind the camera – which means it feels like slightly less of a bare-faced cash-grab than The Bourne Legacy. But the fact is no one knows that much about what Damon’s secret agent is actually getting up to this time around. The Super Bowl spot was cool, but entirely lacking in plot details, and no synopses for the pic have contained any information on that front. In place of hard intel on the plot of Jason Bourne, what we do have is a nifty pic of the so-called “perfect weapon” nicking some presumably unconscious cop’s bike to make a quick getaway (above), and a pretty fascinating cast of series vets and newcomers. Julia Stiles is back as Nicky Parsons, and the film also stars the perennially sour-faced Tommy Lee Jones as – you guessed it – a hardened CIA agent, Ex Machina‘s Alicia Vikander as a cyberspecialist, and the likes of Vincent Cassel, Ato Essandoh, Scott Shepherd, and Riz Ahmed in undisclosed roles. The biggest question mark about this whole thing is whether the new movie will kick off another trilogy of Greengrass/Damon collaborations (a promising suggestion), or whether this is more of a standalone treat for the fans. Both the director and the star have busy schedules and no shortage of projects to choose from, which would make the former option a surprise, but Ultimatum wrapped up the trilogy so effectively that there needs to be some new threat, a big one, to pull the main character out of dormancy. Plus, Jeremy Renner’s Aaron Cross is – so far as we know – still stuck on a Filipino fishing boat somewhere, and it would be weird if seeds weren’t sown in Jason Bourne for him to make a comeback (or at least return to the mainland) at some point. Jason Bourne opens July 25.